…after almost 9 months away? 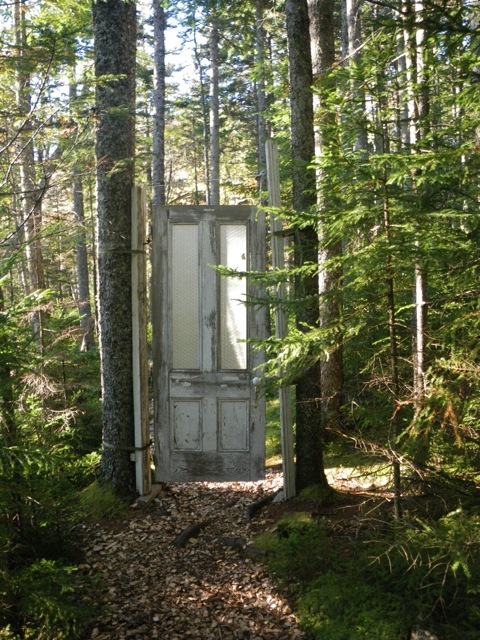 For me it was reading that Genevieve Williamson, whose blog I follow regularly, was going to spend some time in Maine. “Where?” I asked, in her comment section, hoping that a trip to my little island might be in the cards. 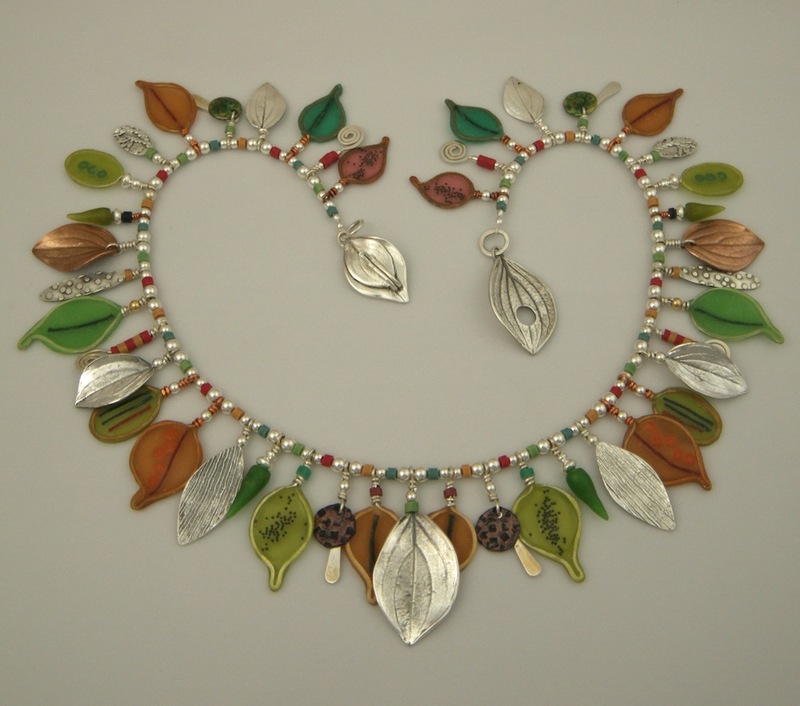 I have admired Genevieve’s polymer clay work for years, starting with finding her Etsy site, Jibby and Juna, and then finding and reading her blog. 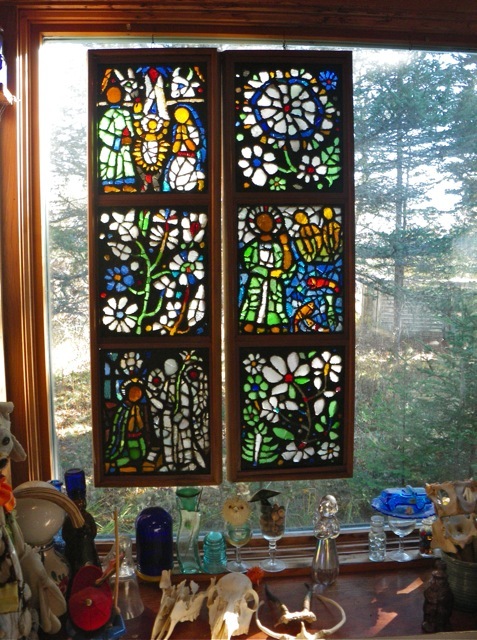 I love her colors, her carvings, her design….her whole approach to the medium. When Genevieve responded to my query, it turned out they were planning to stay in Friendship, about a 2 1/2 hour drive away. Her family has a history of visiting Maine islands and they thought it would be a manageable day trip to spend a day on Little Cranberry. Yippee! For so many reasons. The first being that I finally cleaned up my studio. I’m always curious about another artist’s studio space, and I wanted to be able to show Genevieve my tiny studio without all of the clutter. 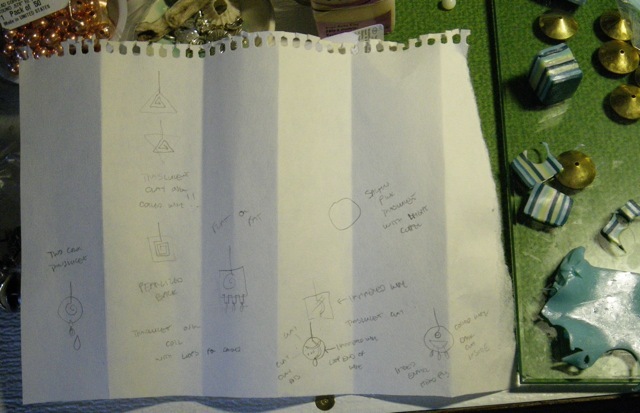 (When my creative energy was renewed from her visit, I benefitted myself with an organized spot to get back to work.) The second reason the visit was a plus is that I got to see my island through new eyes. I live in one of the most beautiful spots in the world, but it is still the place where I do my laundry, pay bills, plan meals, and work. It’s easy to lose sight of so many wonders, until I have a chance to start showing it off to someone who is appreciating it all for the first time. We fit a lot into a short number of hours. 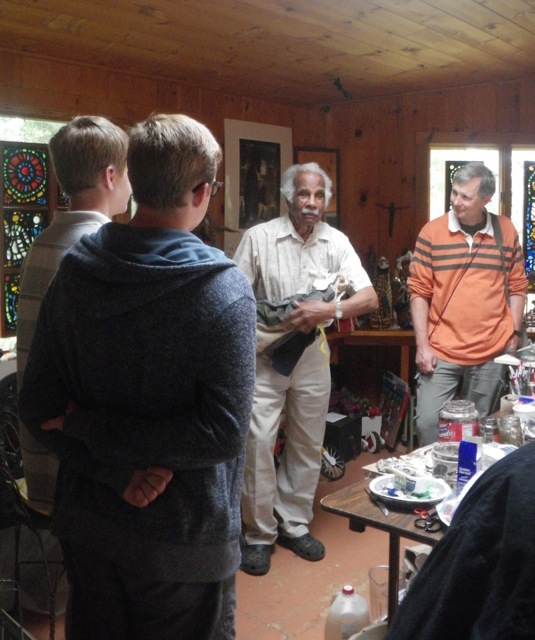 Starting with a prearranged visit to Ashley Bryan to see his studio, his dahlia paintings, and hear how he makes his stained glass window panels from sea glass and paper mache. 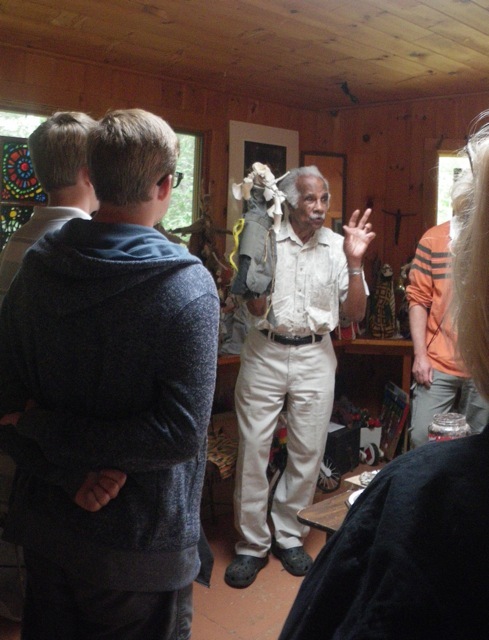 And talked about making his puppets. The very best reason to have Genevieve come to Islesford for a visit, is that we opened the door on a new friendship. It felt like I had known her before, and I know we will keep in touch. As I introduced her to friends at the restaurant or people we met on our walks, they asked, “How did you meet?” We laughed and responded, “We met on the internet!” Thank you for your visit and for inspiring me to get back to blogging. You are welcome to come back any time. I hope we meet up again before too long. I’m getting ready for my last show of the year in Bar Harbor, Maine on Dec. 6 and 7. For me this means: Get out the clay! 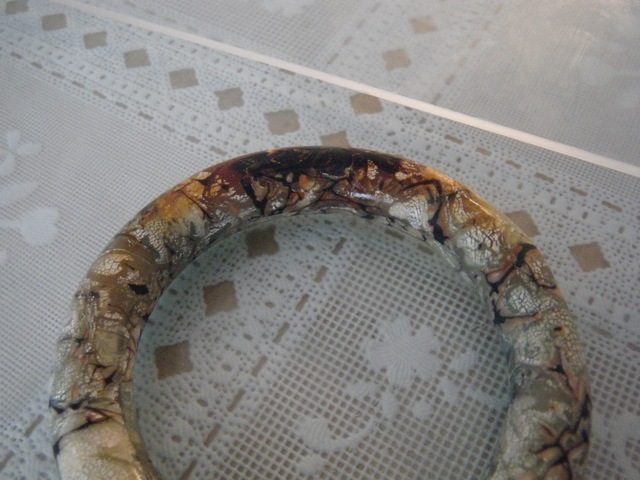 No, not ceramic clay, but polymer clay, fine silver clay and the base metal clays of copper and bronze. 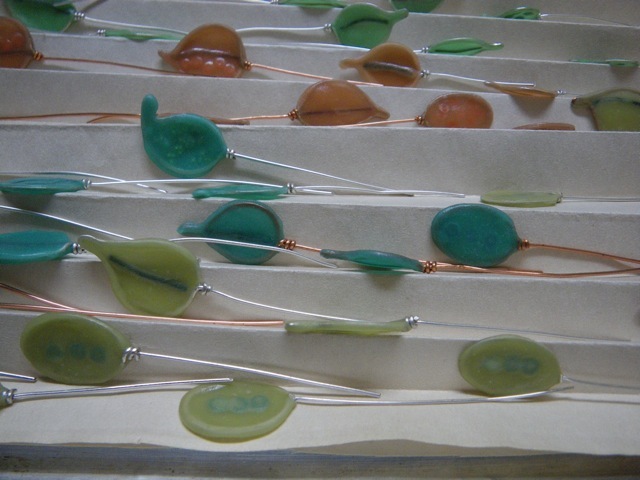 I make many of my own components for necklaces, earrings, and bracelets so there is a lot to be done before I actually sit down and put these components together. I’ve made a few mistakes and learned some new things in the last two weeks and I’m ready to tell all. More about the metals in a following post. Today I’m talking about polymer. My personal discovery of polymer clay goes back to the late ’70’s when I picked up a few packages at the Kimball Shop in Northeast Harbor. I sculpted little lobsterman Christmas tree ornaments for my family and friends and baked them up in my oven. 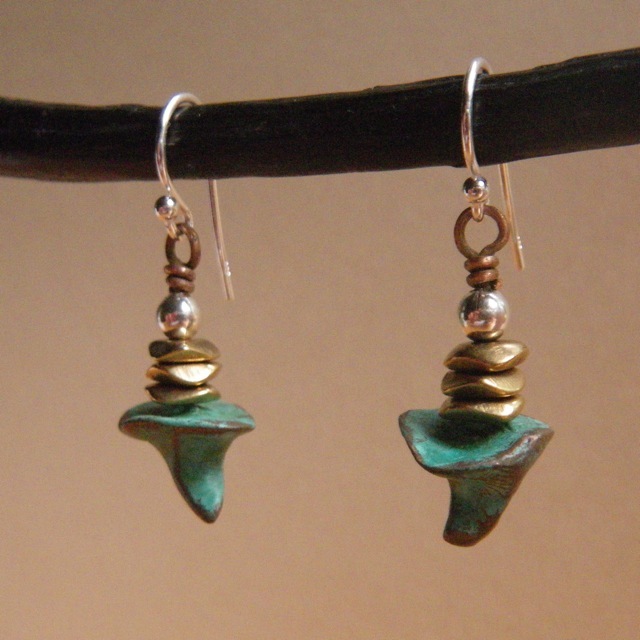 I was only just getting started in making simple earrings with sheet silver and a jeweler’s saw. 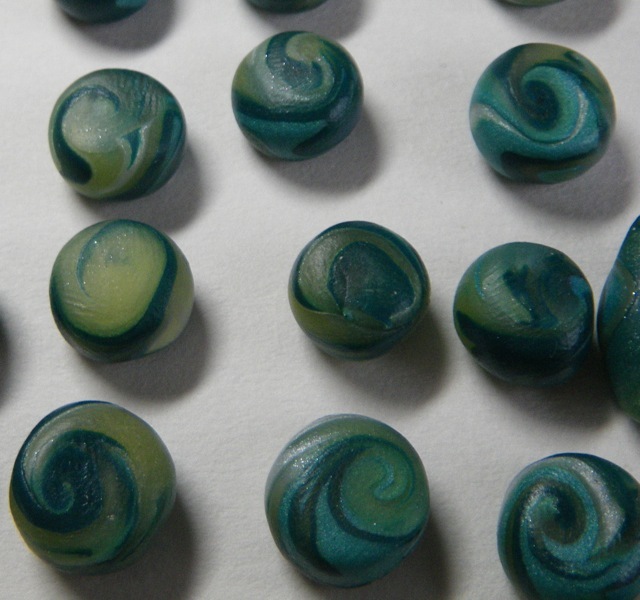 It never occurred to me to mix the Fimo colors and make my own beads. 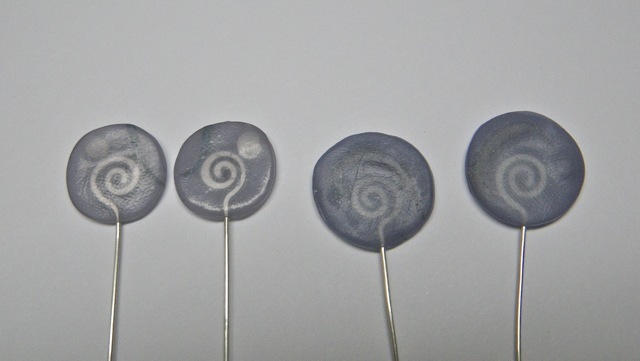 I put the Fimo away for 10 years or so as I was concentrating on working with silver and mothering two babies. 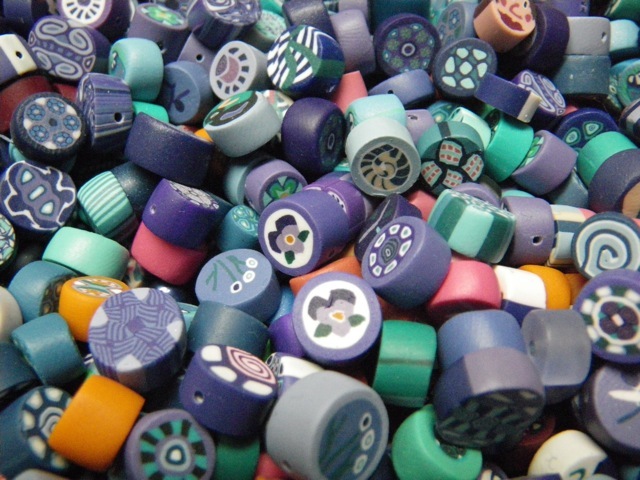 Fast forward to the early 90’s when I started seeing some incredibly intricate patterns on beads made with Fimo. 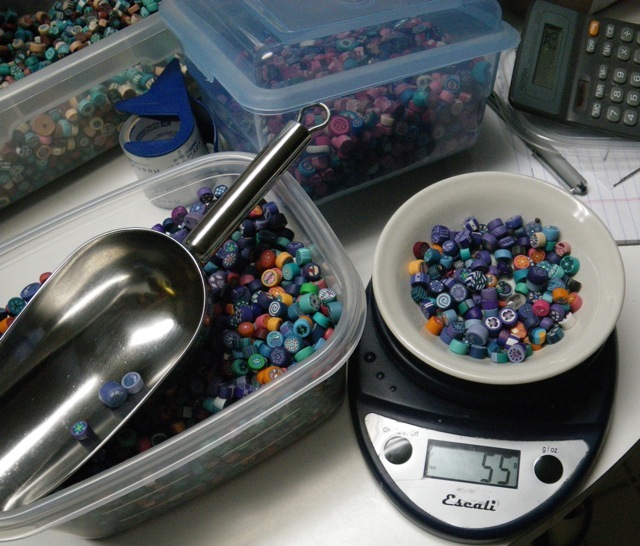 How in the world did they make such tiny patterns on such tiny beads? 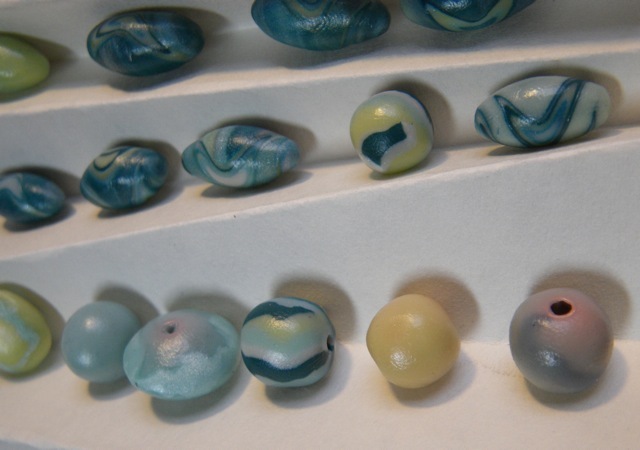 Nan Roche’s book, The New Clay, opened up a whole new world to me and I was off and running making my own beads. 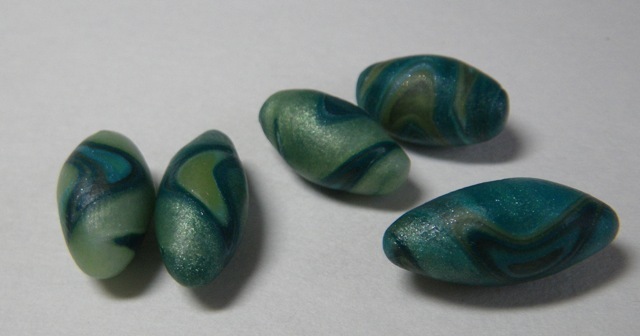 They were simple slices of canes, drilled after curing, but they were beads I made, in colors I wanted. And they were a whole lot of fun to make. 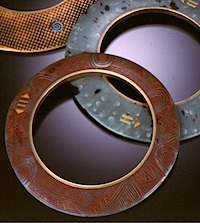 When Precious Metal Clay was introduced in the mid 1990’s I would abandon the polymer clay for many years. 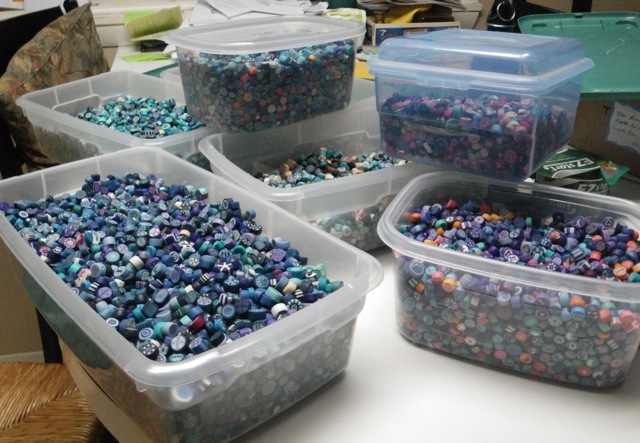 Besides, I had a ton of beads already made if I needed them. 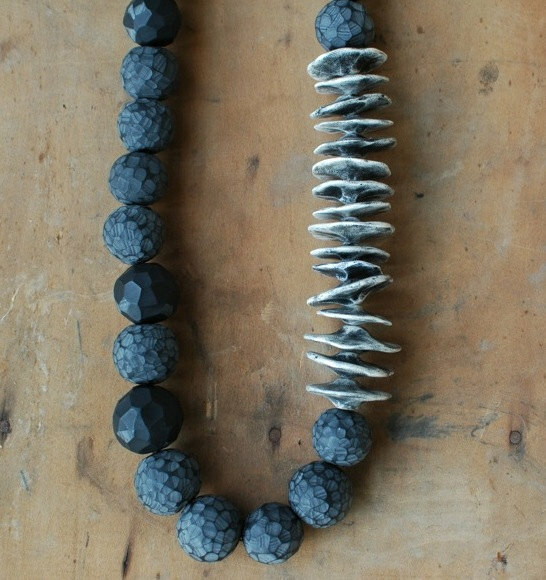 Currently,the amazing things people are doing with polymer clay has drawn me back to this medium. I’m looking forward to spending whole days or weeks pushing my own polymer boundaries this winter. 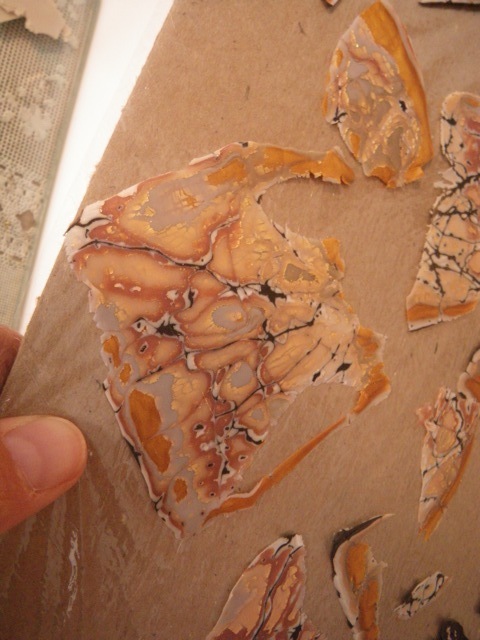 Presently I’m making components from translucent Pardo clay tinted with alcohol ink. I’m usually in such a hurry for instant gratification that I haven’t bothered to record what amounts and colors of inks I’ve used to get the finished leaf color. 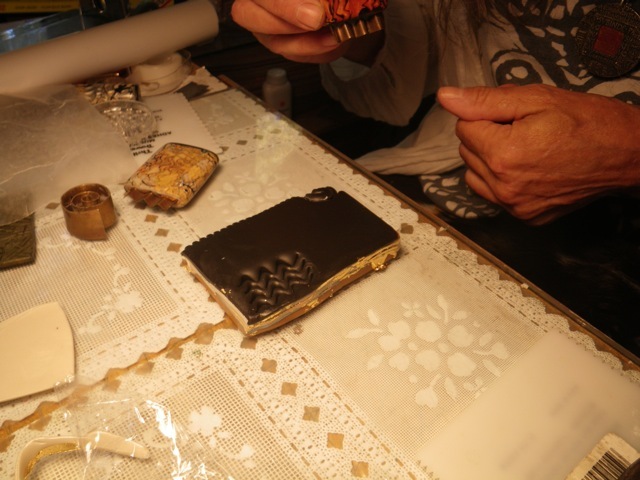 And, I’m never quite sure how they will come out because the Pardo clay is pretty opaque before it is cured. The clay becomes even more translucent when it is cooled, straight out of the oven, in ice water. Information from Pinterest, blogs and FB have inspired me and led me in new directions. 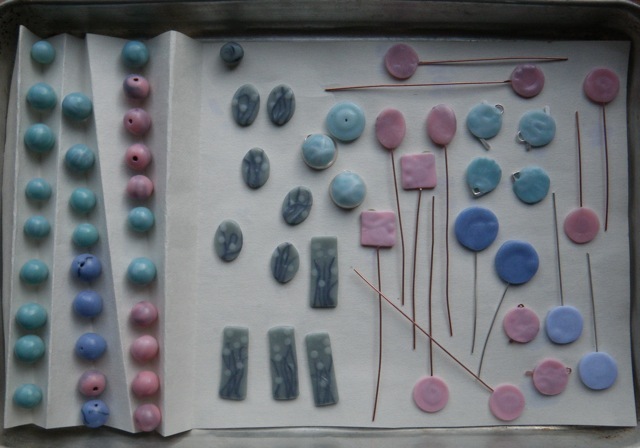 Ginger Davis Allman has a wealth of information, especially about translucent clays, on her blog Blue Bottle Tree. I’ve purchased two of her tutorials to try out this winter. 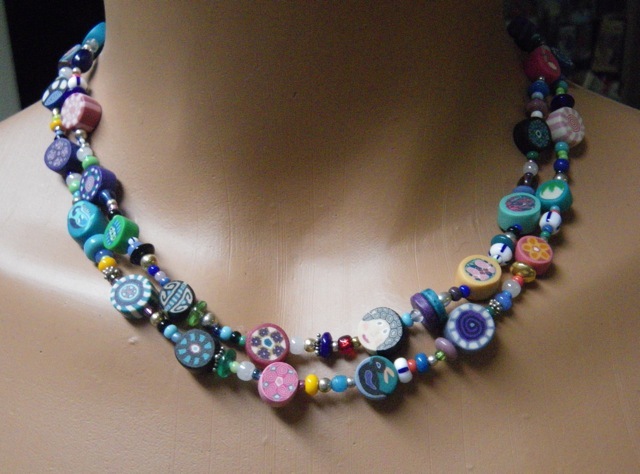 Last week I took (online) a CraftCast course on polymer clay extrusions by Cynthia Tinapple who is an amazing polymer clay artists and writes the blog Polymer Clay Daily. I already had a great set up for extruding polymer clay with the help of an electric drill thanks to one of her earlier posts last summer. I hadn’t used the drill or the technique since August, but I would soon be trying it again. 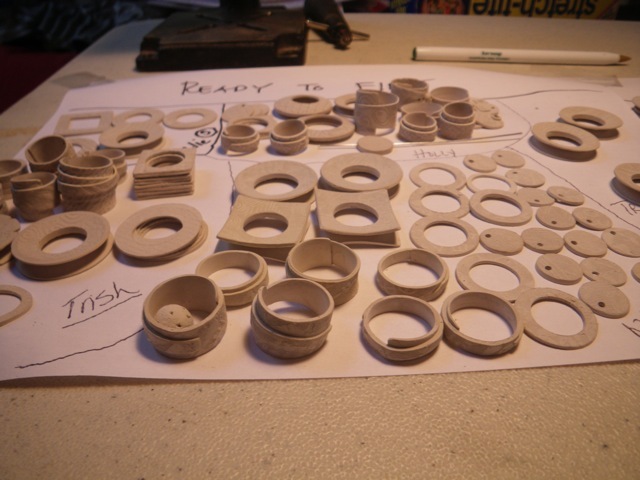 My desire to make more of these bracelets for my shows turned into an unplanned extrusion experiment. 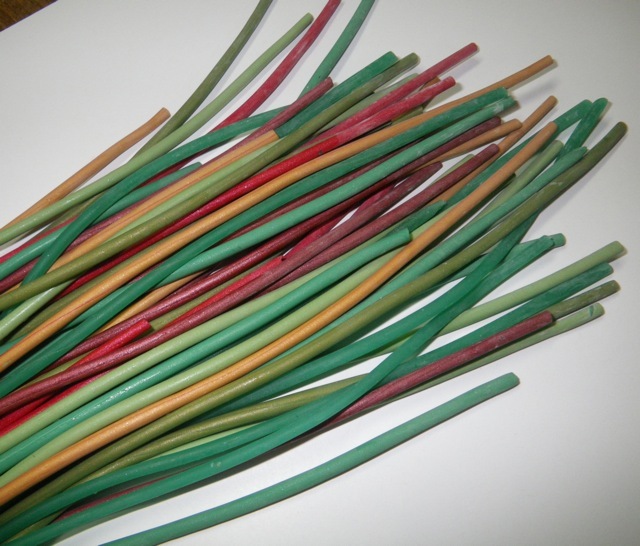 I discovered I did not have the stash of these flexible tubes that I thought I did. Where oh where had I bought those colorful tubes, on Etsy? 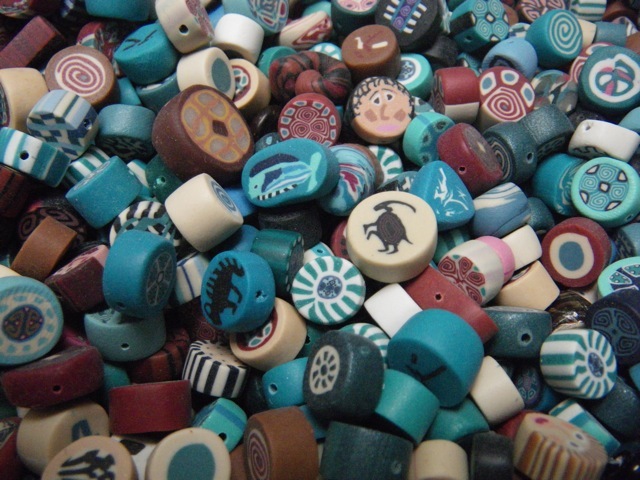 I looked through my purchase info and found out they had come from Mary Soucy’s Etsy shop, Bead Me A Story. It’s a very cool shop and if you have been trying to find those amazing rubber o-rings for your designs, look no further than here. She has them! But what she did not have anymore were the “flexible bugle beads” I sought. I looked everywhere with the help of Google, but I couldn’t find them. I contacted Mary to ask if she would be willing to tell me where I could find them. I asked if she would be willing to sell me a tutorial on how they were made. 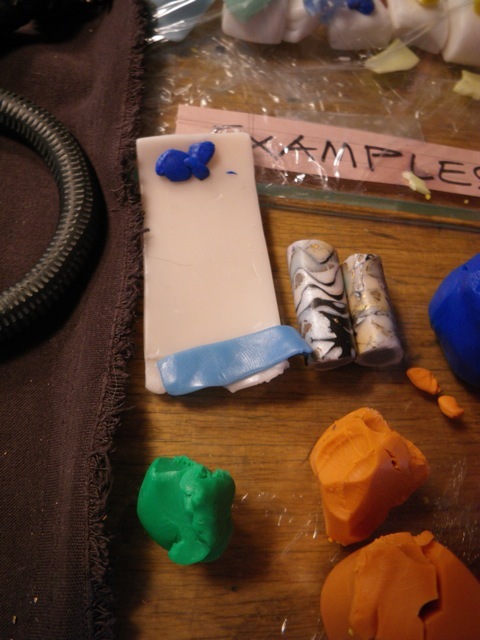 She said that she had used some softer matte finish clays that were no longer available, and “Basically they are just made with a clay extruder “Makin” was the brand of extruder I used and then you can buy tips which make the holes in the tubing as you extrude it. I don’t remember what store I used to use but the hole makers are the same brand as the extruder. Before I even looked for the tip I needed, I sent Mary the link to Cynthia’s post on extruding clay with the help of a drill. “Sweet tip!” was her reply. It is a true hand saver. Thanks to island living and Amazon Prime, I am a very resourceful internet shopper. I had the extruder tip I needed within two days. 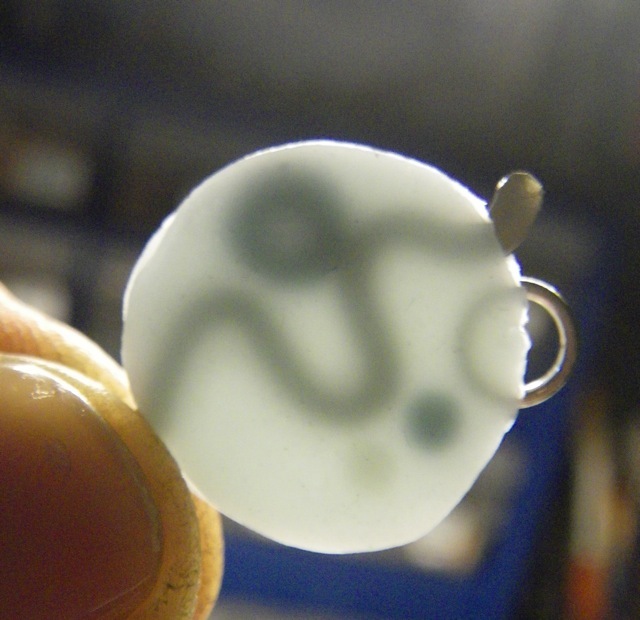 And with a bit of a learning curve that involved a few wisps of smoke coming out of my drill (one needs to have very very soft clay to push it through the two-tip combo for making small tubing) I was making my own slightly flexible tubing. I used cornstarch to keep the tubes from sticking together while fitting as many as I could on the tray to go in the oven. This new-to-me process totally worked! 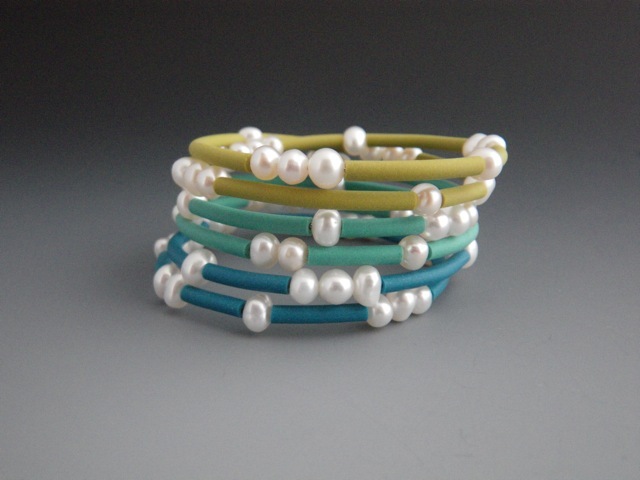 Now I need to get back to the studio to make some bracelets. 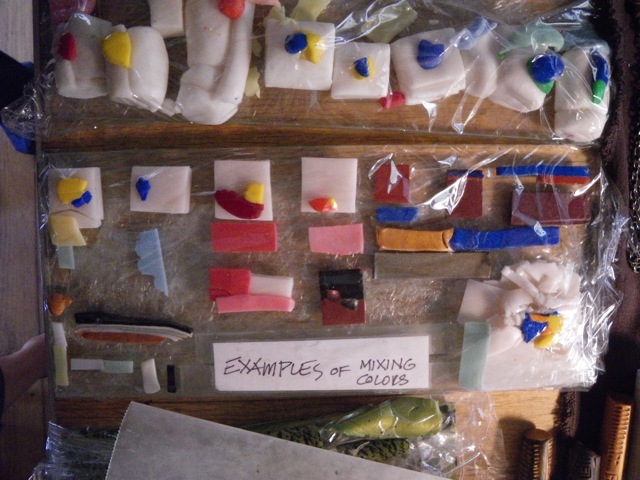 After checking out the recent blog of my friend Holly Kellogg, and her reference to the polymer clay work of Katrin Neumaier, I decided to get out some of my own translucent Premo clay from last fall. 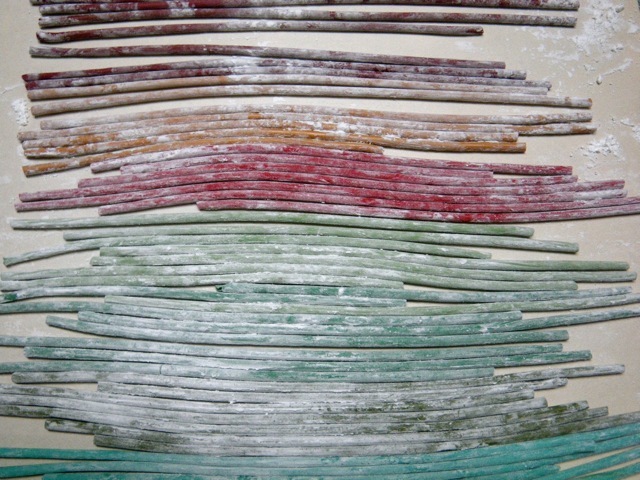 I also ordered some translucent Pardo clay, inspired by Katrin’s incredible pieces. Holly blogged about some of her trials and errors with the Pardo, so I decided to try alcohol inks for tinting the translucent clay. It had been at least a few months since I worked with polymer clay, so I warmed up by fooling around with some simple beads. 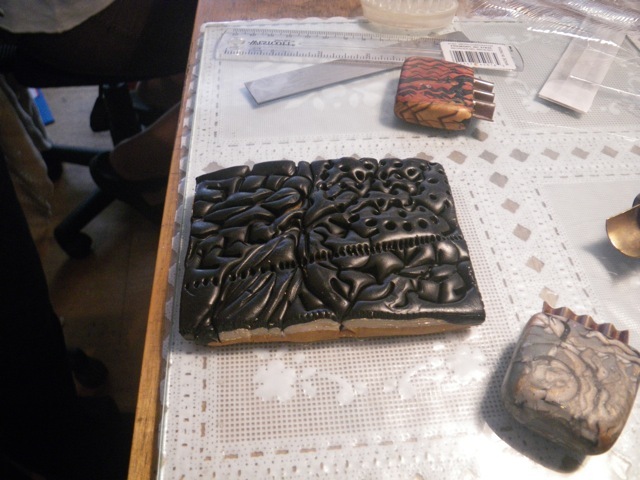 It took most of the first day just to condition the different clay colors I wanted to use, including some opaque colors. 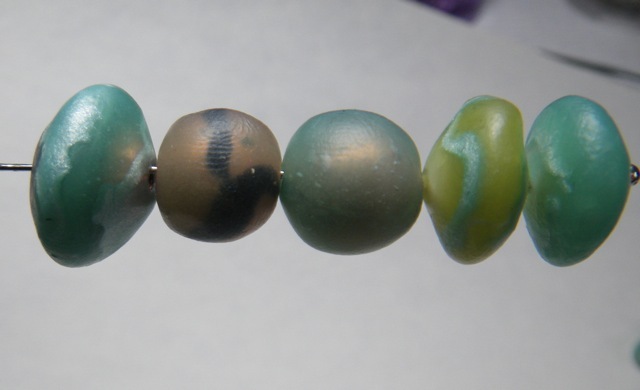 I tried covering some mother of pearl beads and some copper beads with the mix of clays. 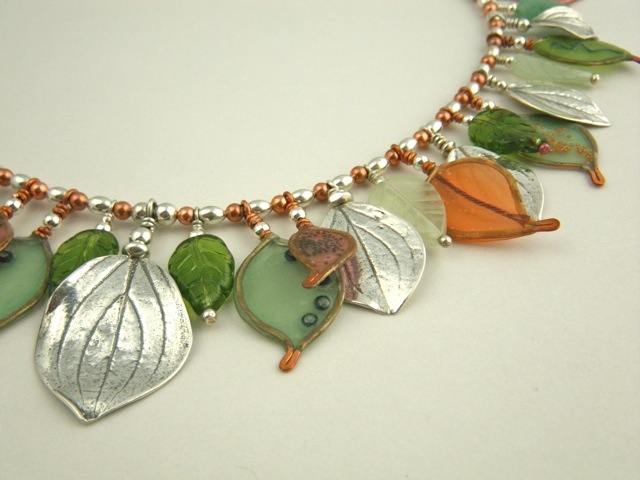 The lighter green also disappeared when layered over a copper bead. 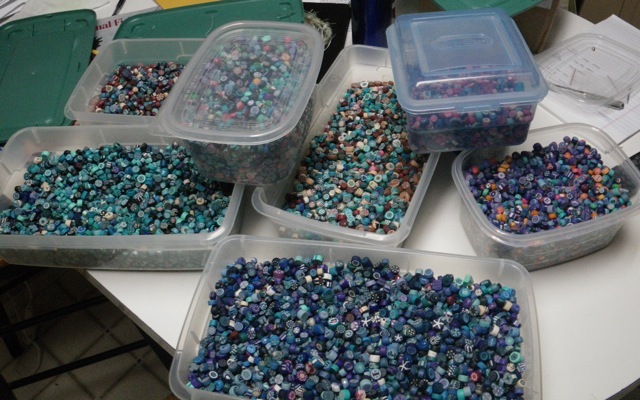 I was happy with some of the beads, so all in all it was a good warm up. Don’t you love it when you can’t wait to wake up in the morning to get going on a new idea? I filled my day in the studio with systematically mixing alcohol inks with two kinds of translucent clay; Pardo and Premo. 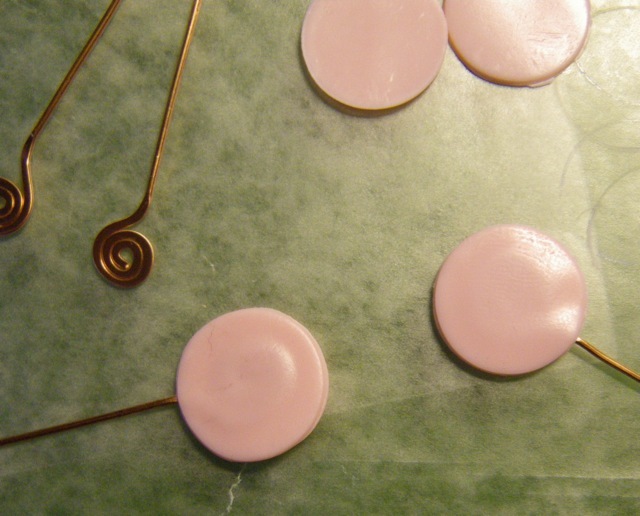 I made similar earring components with embedded copper wire and pieces of silver, brass, and opaque clay. I couldn’t wait to see how they differed when fired. They sure handled differently. Premo is much softer and easier to condition. It looks more translucent in its pre-fired state. 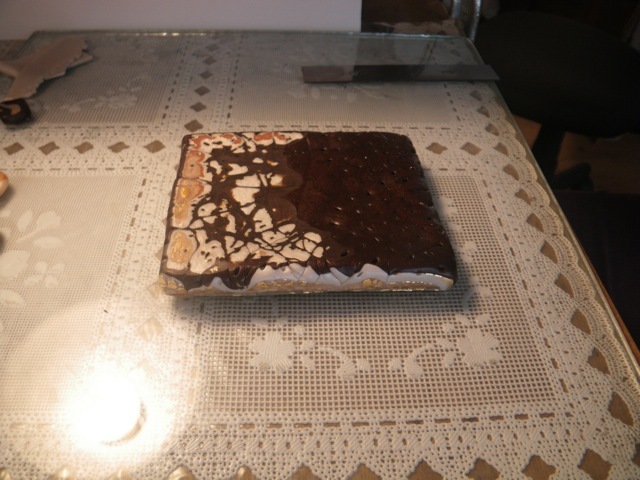 Pardo is crumbly and annoying to condition and it is more opaque in its unfired state. 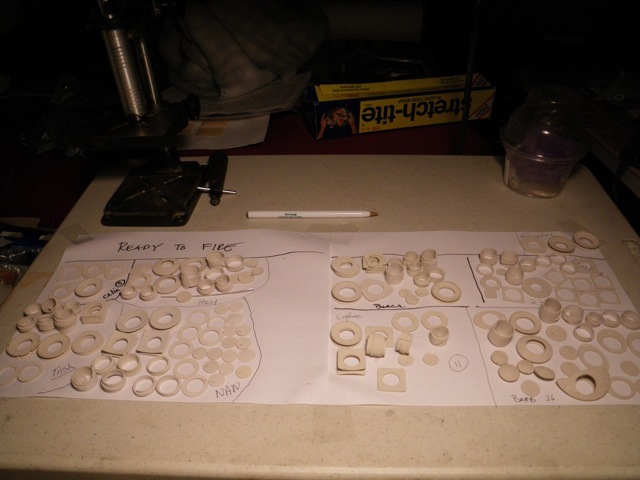 For each earring I rolled the clay to a #3 on my pasta machine. Holy Pardo Batman! There really is a significant difference between the translucence of the two clays. This is the first time I have used alcohol ink to tint clay. I was pretty relieved to see the Pepto Bismol pink turn into more of a salmon color, and the blue turn into less of a milky purple. 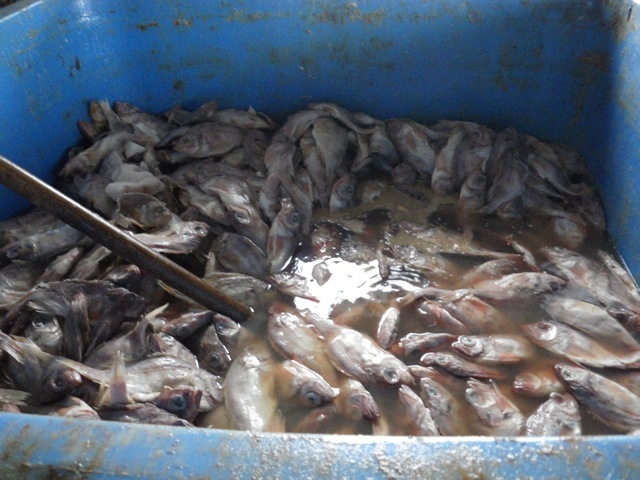 I learned a few more things from this batch that I will blog about later. I’m headed for bed and a day off-island tomorrow. A whole day in the studio! And no photos to show for it. 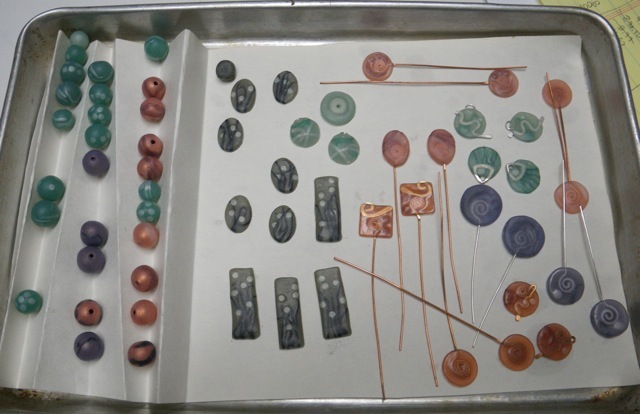 Yesterday, I combined different brands and colors of polymer clay together, working with a variety of green colors. 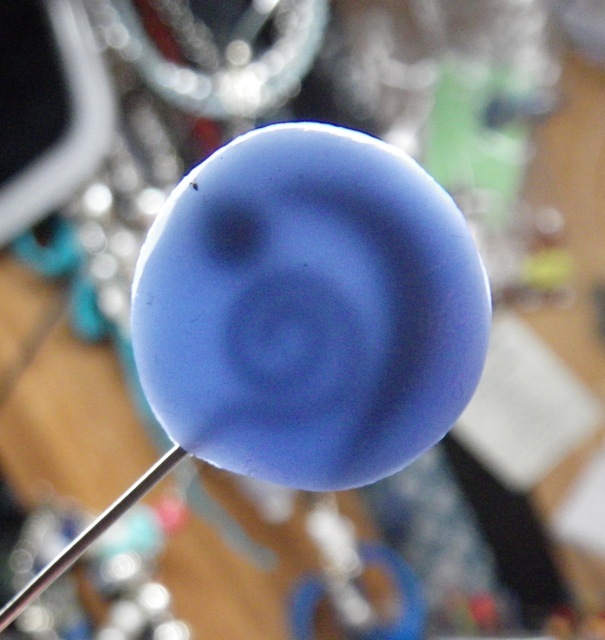 I hoped to get a layering effect with some of the translucent clay. The colors were darker than I expected after firing. 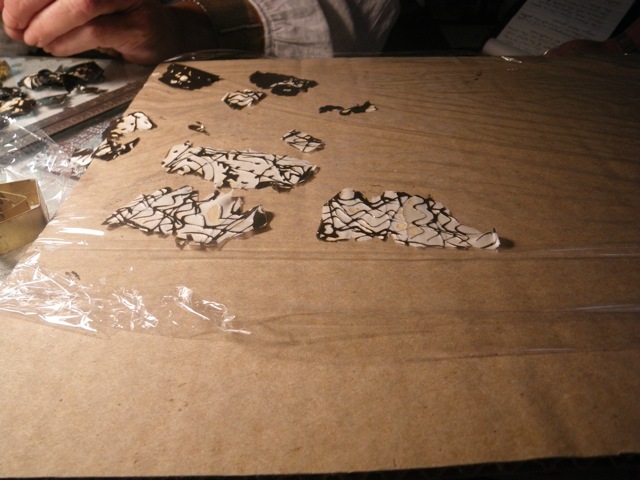 Some of the pieces I expected to be translucent were not. I used mostly Premo yesterday afternoon, and one of the alcohol inks I used was a citrus green. 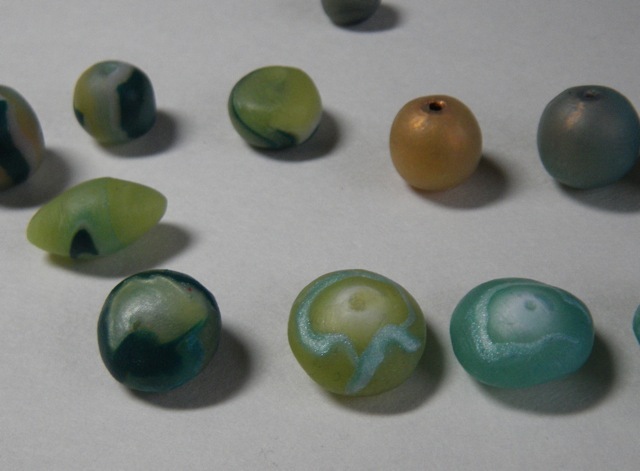 After I fired those beads, the light green clay looked like pee! I have forgotten a lot of what I used to know about polymer. Today, I decided to get a little more organized. I kept the Pardo translucent separate from the Premo translucent. I tinted each one with the same color ink. 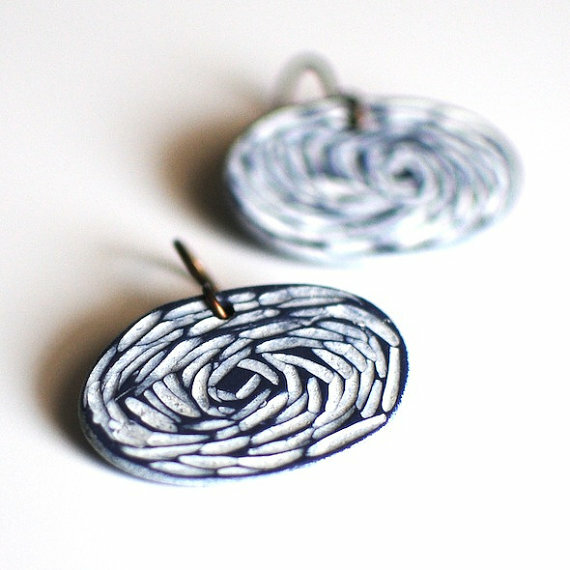 I made similar earrings to see how the two clays differ. 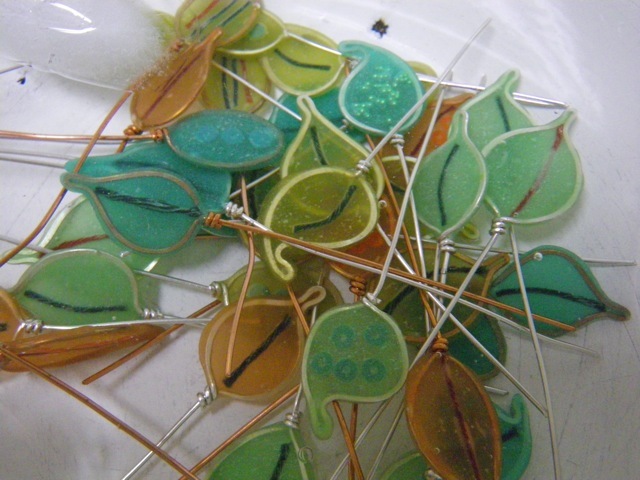 I haven’t fired this batch yet, so I’ll wait to do that tomorrow and take more photos then. One thing I do know, I like the feel of the Premo translucent clay much better than the Pardo. 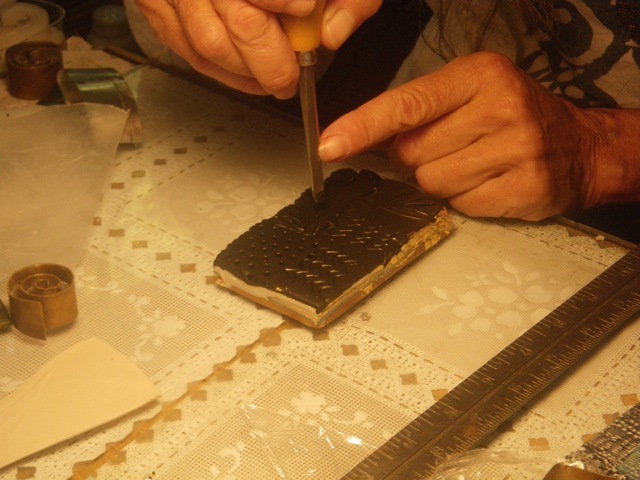 Pardo was dry and crumbly, and took much longer to condition. 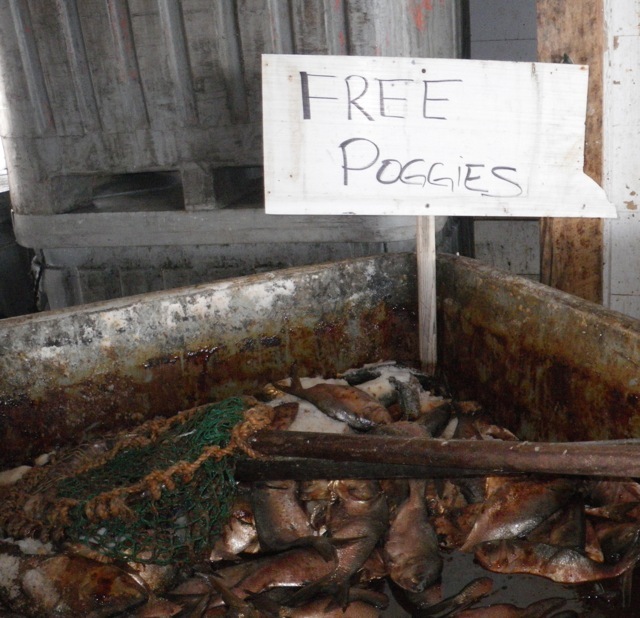 In the meantime, I’ll post some photos of lobster bait at the Cranberry Isles Fishermen’s Co-op. I know. It’s pretty random. 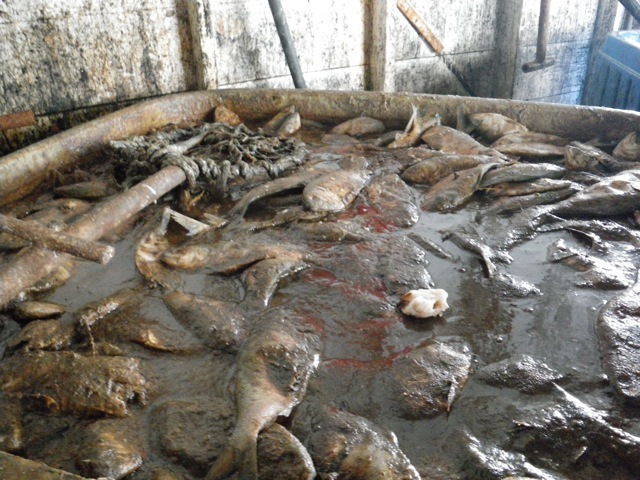 Some bait gets so old, it can’t even be given away! 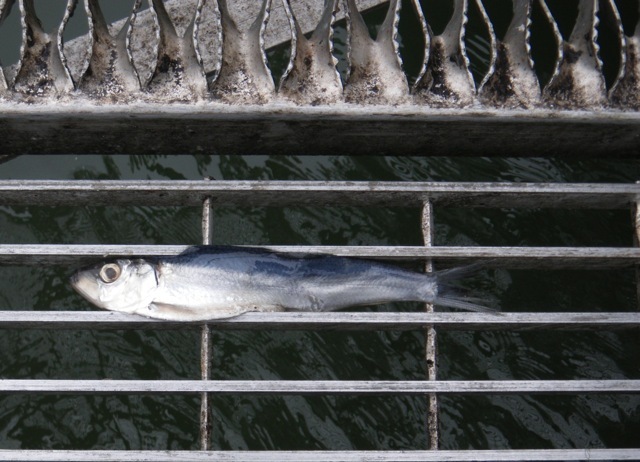 And some bait gets left behind, unintentionally. 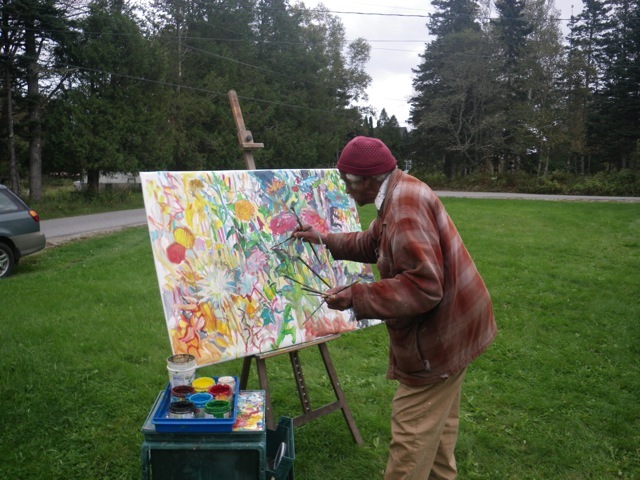 I’m off in the morning for a 4 day class with Celie Fago in Bethel, Vermont. I’ll meet up with my friend Holly Kellogg to stay at the home of friends Donna and Henry Isaacs. So much opportunity to be surrounded by art and creativity. I can’t wait! After the busy weeks before and after Robin and Stephanie’s wedding, and after supporting my mom as she recovered in the hospital, I am ready and more than excited to be restoring some depleted creative energy. 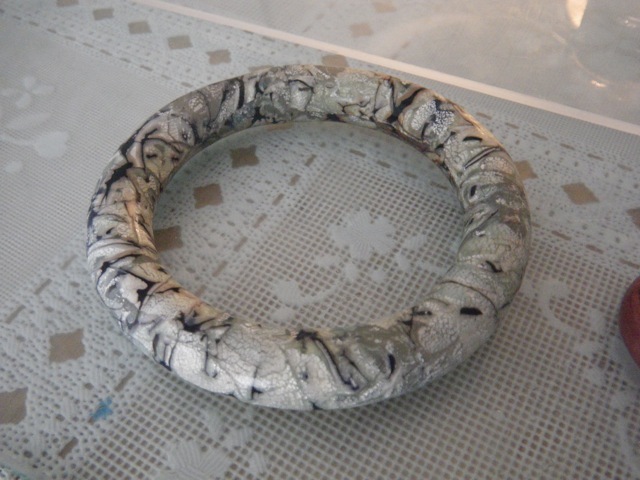 The workshop will be making bracelets using polymer clay, and some metal clay. 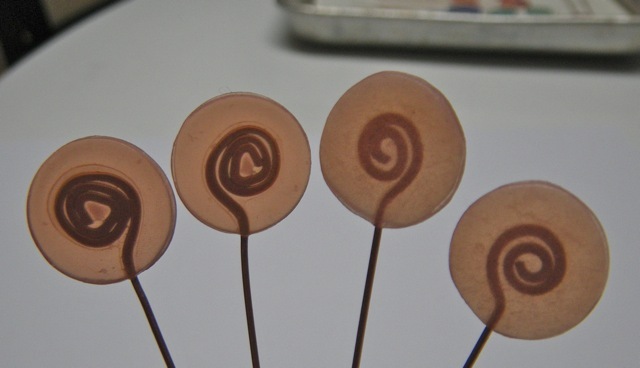 Below are photos of Celie’s work as samples of the techniques we will learn. It’s supposed to be a drizzly weekend in Vermont. I doubt I’ll even notice the weather. 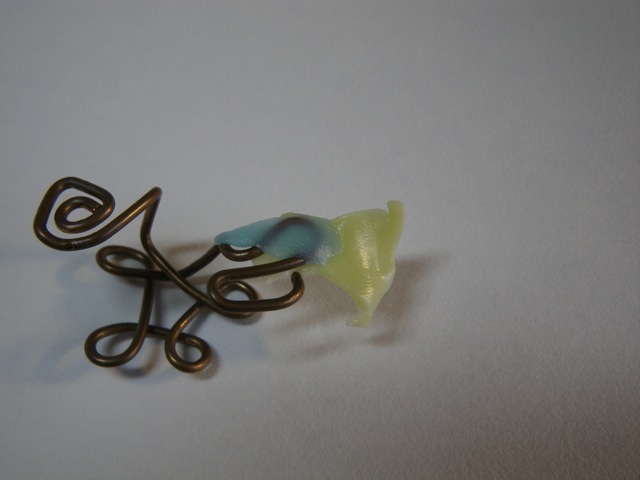 Below are more earrings from my patina experiments. 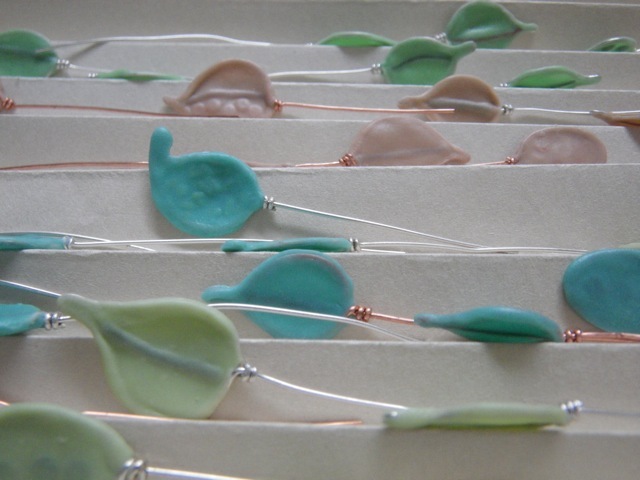 Copper metal clay headpins with verdigris patina. 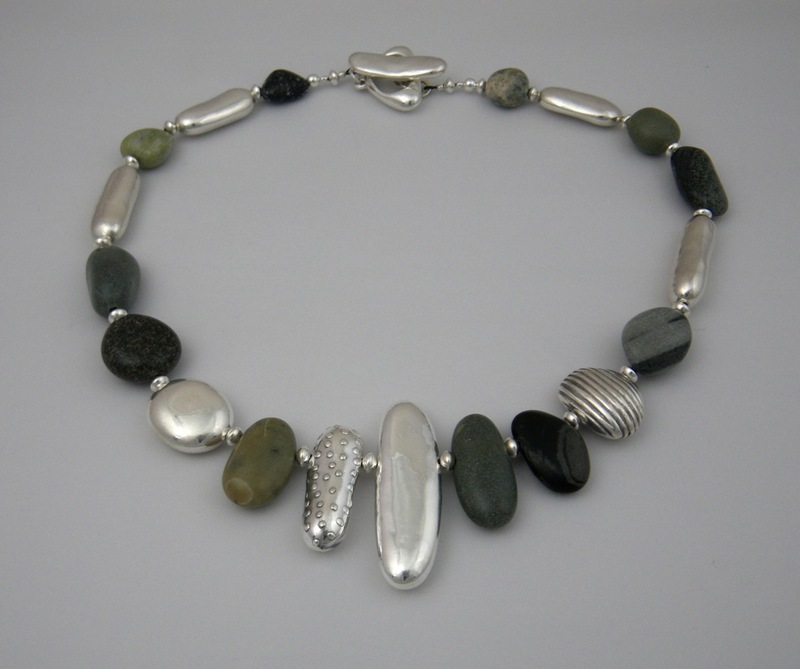 I’m having a blast exploring alternatives to using silver. These earrings remind me of something from a Dr. Seuss book. I’m not sure if that’s a good thing or not, but I’m looking forward to more work with the base metal clays and how well they accept patinas.